The almost-universal sentiment when the iPad Pro came out was: Hardware Good, Software Bad. I wrote about this again recently, saying that ﻿the debut of iPad Pro was the opposite of the original iPhone﻿: Where the original iPhone had great software, it was kneecapped by slow hardware; on the other hand the iPad Pro has PC-speed hardware, but the software (apps and, to some extent, iOS) were met with a giant collective shrug. So, why would Apple release a great new hardware product like iPad Pro (even the iPhone 6s is super speedy and could use a better Mail and Photo apps) and let us down in terms of software? Apps can only be as powerful as the operating system they’re running on, and iOS 9 is limited by its support for very old devices with very slow CPUs. Let me show you a few graphs to illustrate what I mean. 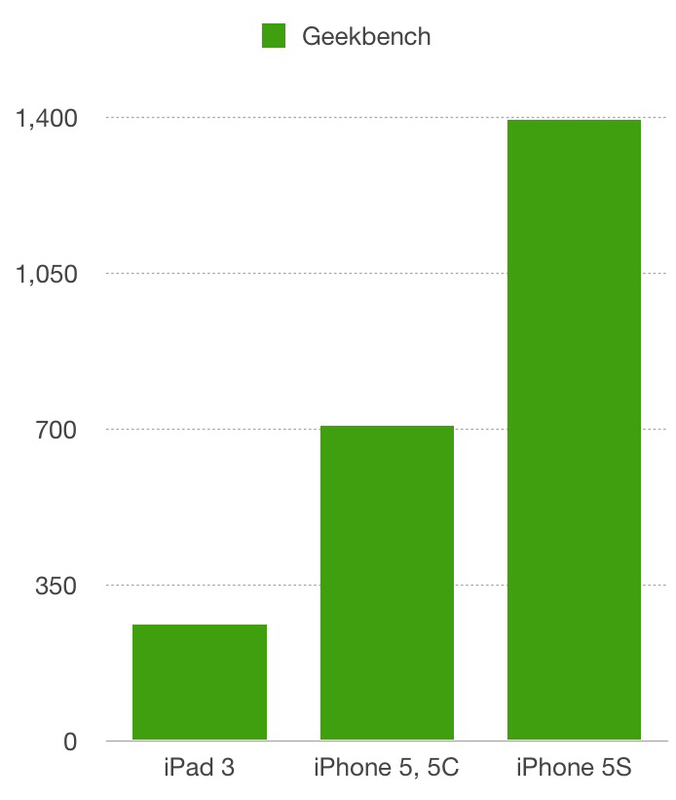 The graph above shows the relative performance (using Geekbench 3)* of some of Apple’s early iOS devices. You can see that they generally get faster every year, sometimes by as much as 33% faster. This is nice, but not earth shattering. As each version of iOS gets a little more powerful, older hardware is no longer supported. The key here is that iOS can only get as powerful as the slowest hardware that it supports. Think about that for a second. As powerful as an iPhone 6s or iPad Pro is, iOS 9 still has to support iPhone 4S and iPad 2 devices. So Apple couldn’t make iOS 9 and apps like Mail and Photos super powerful on the iPad Pro, because they’d be dog slow—or not work at all—on these older devices. So the question becomes: What devices will iOS 10 drop support for, and what is the performance difference between the devices in the graph above and the new slowest device that iOS 10 supports. Well, the logical option is for Apple to drop all the devices above, and support only the iPhone 5 and iPad 4 and above (A6/A6X processors). 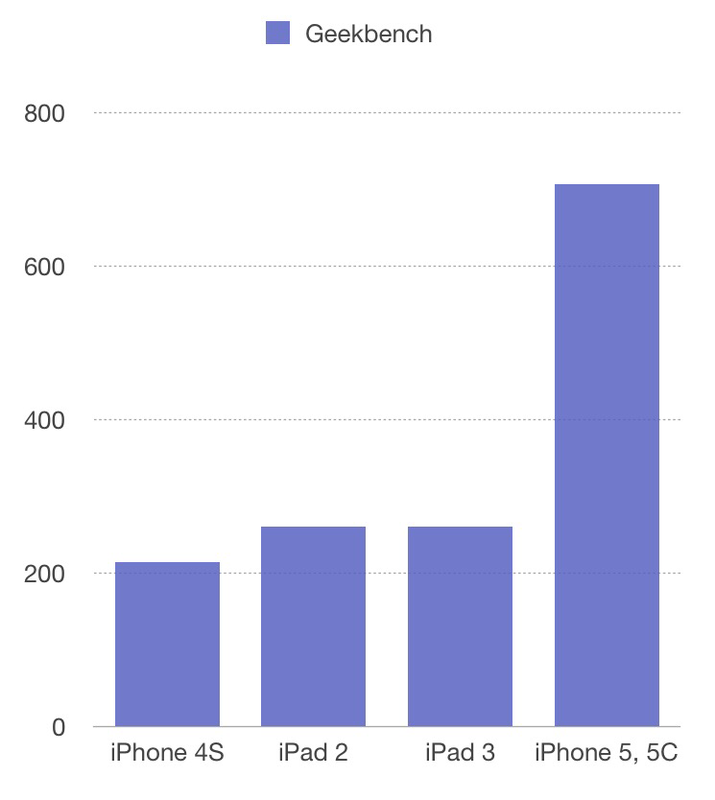 So how big is the performance jump from the A5 (iPhone 4S, iPad 2&3) to the A6? This graph shows the incredible performance increase from the A5 to the A6: we’re not talking a 10% or 25% or even 33% faster CPU, we’re talking about a CPU that’s 2.5x faster! I’m not promising any of these things, but these are just some of the possibilities that you can envision once the shackles of old hardware are removed from iOS. That’s right, at a Geekbench score of over 3,200, the iPad Pro is over 10x as fast as the iPad 3. We are entering the golden age of mobile computers, which means software will start peaking at what it can do. (It also means we are on the cusp of when wearable devices like Apple Watch start their inevitable climb to mostly replace mobile devices.) Soon there will be no limitations as to what your device can do. This graph tells you about the possibility of further improvements in iOS 11, when, presumably, the iPhone 5 & 5C (A6) will be dropped from support, and the iPhone 5S (A7 CPU) becomes the slowest device that’s supported (that will also mark the beginning of exclusively 64-bit software in the mobile space). The 5S is again 2x as fast as the 5 & 5C, allowing iOS 11 to do much more than even iOS 10 will do. For now, we can be content that iOS 10 has much more potential to help iPad Pro and even your iPhone 6 or 6s become the killer device that its hardware allows it to. So prep yourself for WWDC 2016—it’s going to be a doozy. 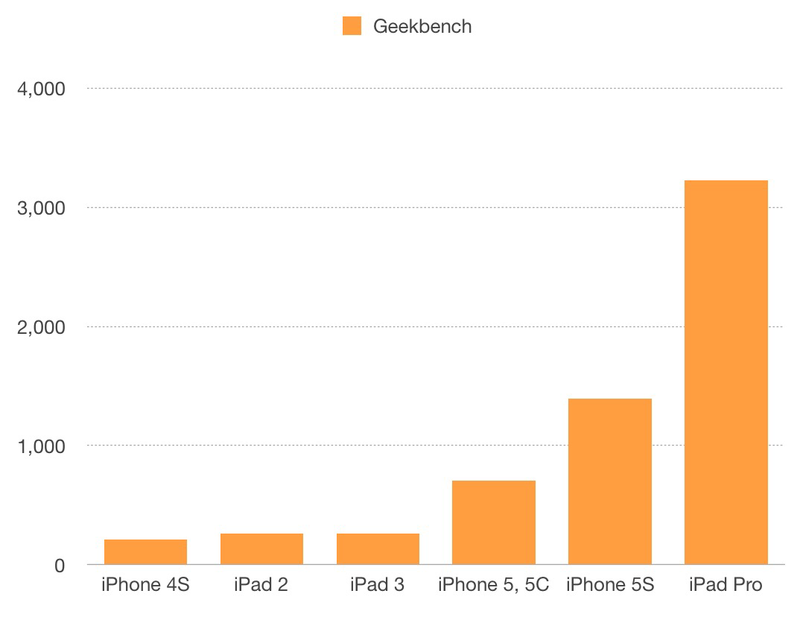 *—Yes, Geekbench is not the end-all, be-all of device performance. 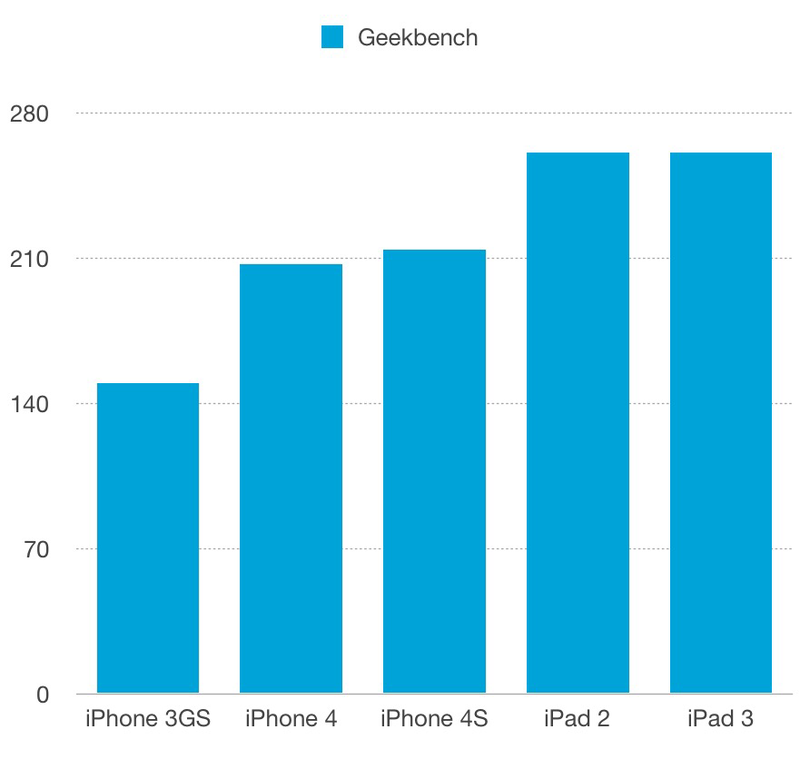 For example, the iPhone 4S seemed much faster than the iPhone 4 even though their Geekbench scores are very similar. Perceived performance is more than just CPU speed: it’s I/O speed, memory, GPU speed, number of GPU cores, etc. I’m just using Geekbench here as a proxy for overall relative speed. ← Rumored MacBook Pro OLED touch bar to mimic iPad Pro? I have a hunch that Apple might drop support for non-64 bit processors altogether, supporting only A7 chips and above. Sounds tidier and cleaner. Though the better alternative might be to simply break up iOS into iPhone OS and iPad OS. Yes, I included the bit about iOS 11 at the end, partly to get people to understand just how big a difference dropping the last of the 32-bit CPUs would be. I was a big proponent of Apple going all-64-bit in iOS 10, but iOS 9’s support of so many old devices tempered my enthusiasm a little. As for padOS—many people are promoting this, but I don’t see any real benefit. Certainly not easier for app makers (another OS?!). And as recently as WWDC 2015, Apple is heavily promoting universal iPhone/iPad apps. A padOS would seem to conflict with that advice. Even today, in one OS (iOS), developers can share as much—or as little—as they want between the iPhone and iPad version of their app. And we have iOS apps like Pages, Keynote, and OmniGraffle, which are virtually as powerful as their desktop OS X versions. So how would a padOS help? The iPhone 6s has 2 gb ram and A9 processor, which actually makes it more powerful than the iPad Air 2. I agree that I wouldn’t want productivity apps to be limited only to the iPad. My primary concern is that Apple seems to be devoting way too much resources to the iPhone. No surprise there – it is their main revenue driver, so it naturally gets the most attention. The iPad interface often feels like just a blown up phone UI, as do many iOS apps. Many new features seem like they were developed with the iPhone in mind, then retrofitted for the iPad. There is a certain irony in the iPhone having 24 icons on the home screen when the iPad is still limited to 20. A PadOS might mean a separate team gets to focus solely on developing for more tablet-centric features for the iPad. Of course, there has to be close communication with the iPhone team to avoid duplication of work for core apps such as safari, mail and calendar. Maybe that’s not how it’s done at Apple, but the iPad just feels like it is playing second fiddle to the iPhone at this stage. Split-screen and PIP are a step in the right direction, let’s see how committed Apple is to making the iPad a PC replacement. Would love to see the iPad Pro have more of a dedicated file manager to it, and to enable easier integration and multiple file management with the Google Drives and Dropboxes of this world. I wonder if a combination of extensions and scripting—possibly with Swift—would accomplish everything that we think we need an exposed filesystem for. Unsure. The old paradigm of a file cabinet with folders is still relevant, given how poor meta information is about file types. I wonder how much more difficult it would be for iOS to add a file system. So basically the choice is between either a) dropping support for older devices or b) under-utilizing newer devices ? With Apple favoring a) for now ? Also, parallel to the toaster-fridge joke about phones and laptops, isn’t using a phone-targeted OS on a tablet kind of a microwave-fridge situation ? Well, typically, you differentiate OSes based on user interaction technology, not device or screen size. All 3 also use voice as input. And you can hook a Bluetooth keyboard up to iOS & tvOS. So, yes, iOS & watchOS are both touchscreen, but there is additional core hardware on Apple Watch that doesn’t exist on any iOS device. And Apple Watch is *so* much smaller than an iOS device that the UX has to be reworked, so apps must be designed very differently. Therefore, from a software development point of view, iOS, tvOS, & watchOS devices need separate “storyboards” in Xcode because they are so different. What Apple has chosen to do (in a very smart way, I might add) is make storyboards reusable between iPhones and iPads, thus keeping them both on iOS. – On OS X, you have a 12″ MacBook and an iMac with a 30″ screen. Why aren’t these two OSes, if size is a big deal? – On iOS, where does padOS begin and phoneOS end? Do you want a complicated OS on iPad mini? If not, then iPad mini and iPad Air, which have the exact same pixel dimensions, would end up having 2 different OSes. – We have very powerful apps like Pages, Keynote, OmniGraffle, and Pixelmator that are very similar on iOS and OS X. So what does a padOS need, if apps are already as powerful as their Mac equivalents? What is “typically” in “typically, you differentiate OSes based on user interaction technology” ? Windows doesn’t do that, ChromeOS doesn’t do that. Linux doesn’t do that. Android doesn’t even really do that (there are non-touch Android desktops/laptops). Only Apple does that. And other input variants (gamepads, trackballs, trackpoints, voice, pen …) don’t have dedicated OSes, just dedicated UIs on the same’ol OSes. This sounds like one company’s random hang-ups, or a marketing slogan (“if you need a pen, you failed”, “toaster-oven”, etc…) mysteriously and mistakenly turned into a core tenet. Also if making storyboards reusable on phones and iPads is smart, wouldn’t making them reusable on Macs too smarter ? This all seems a bit random to me.